American University Washington College of Law is pleased to announce its Second Annual National Health Law Writing Competition. This competition is designed to encourage law students to write scholarly papers on current topics of interest relevant to health law. Health law encompasses aspects of almost every area of law. Papers may address any area of the law as applied to the health care industry (e.g., antitrust, criminal, corporate, ERISA, among others) or areas of law unique to health care (e.g., fraud and abuse, reimbursement, privacy, access to health care, pharmaceutical/drug law, among others). Entries will be considered for publication in the WCL Health Law and Policy Brief. Law and Government LL.M. students who are interested in health law and policy are eligible to earn a Health Law Specialization Certificate. The Specialization is a rigorous program designed to prepare lawyers for successful careers in the dynamic field of health law. To fulfill the Specialization, students must complete a minimum of 12 credits from a list of approved courses and must write either two twenty to twenty-five page papers on health law topics or write one such paper and complete one externship in the field of health law. Students who specialize in health law are encouraged to complete Health Law (4 credits) and Administrative Law (3 credits), in addition to a selection of the wide range of specialized health law courses offered both during the academic year and in our innovative Health Law & Policy Summer Institute. Students meet regularly with the Associate Director of the Program on Law & Government and the Health Law & Policy Fellow to design a curriculum that meets their individualized needs and objectives and to ensure that they are on track to meet their goals. Students specializing in Health Law are encouraged to earn academic credit through experiential learning. Washington, D.C. offers students a wide range of health law externships. These externships enable students to make valuable professional connections and to translate their classroom efforts into practical experience. The Program on Law and Government encourages LL.M. students to explore the many externship opportunities available in the nation’s capital and is committed to helping students find externships that are tailored to each student’s interests and goals. In addition to regular academic year offerings, students are encouraged to participate in the Health Law & Policy Summer Institute. This flexible one-week program provides students and practitioners with training on a broad spectrum of cutting edge health law and policy topics. Custom-developed courses taught by prominent health lawyers from private practice, health care organizations, government, and nongovernmental organizations provide an intensive learning experience. Academic credits earned in the Health Law and Policy Summer Institute may be used toward the LL.M. Health Law Specialization. For more information about Health Law & Policy at WCL, the LL.M. Health Law Specialization and/or the Health Law & Policy Summer Institute, please contact Health Law & Policy Fellow, Professor Asha Scielzo at scielzo@wcl.american.edu. Zika virus is a mosquito-borne disease currently spreading throughout Central and South America. Since March 2014, 14 countries and territories of the Americas reported cases of Zika infection. People with Zika infection usually suffer from fever, skin rash, muscle and joint pain, malaise, headache, and conjunctivitis. These symptoms usually last less than one week and are mild. Four out of five people with Zika virus have no symptoms, according to the World Health Organization (WHO). Most cases of Zika infection require no specific treatment, but a growing concern is the effect of Zika virus on pregnant women and their newborn babies. In November 2015, the Ministry of Health of Brazil noted a marked increase in microcephaly (in which the head circumference of newborns is smaller than expected) that coincided with Zika virus circulation in the country. Zika virus is affecting multiple counties in Latin America. The number of Zika cases among travelers visiting or returning to the United States will likely increase and the virus is expected to spread to North America. Currently, affected regions are advising women to avoid getting pregnant due to the link to birth defects. Additionally, pregnant women are being advised not to travel to affected areas. Experts say that Zika may rise to the level of a global threat because there is no vaccine or treatment available. Preventative measures that people in affected areas can take include avoiding mosquito bites by using Environmental Protection Agency (EPA)-registered insect repellant (which are all evaluated for effectiveness); wearing long-sleeved shirts and long pants; staying in places with air conditioning or that use window and door screens to keep mosquitoes outside; and sleeping under a mosquito bed net. In the upcoming weeks, WHO and other organizations will monitor the development of the virus. WHO is concerned that this year’s El Nino could cause the virus to spread further through an increase in mosquito populations. El Nino typically brings warmer temperatures and shifting precipitation patterns, creating ideal breeding conditions for mosquito populations to thrive in. Reduction of standing water is necessary to interrupt the mosquito breeding patterns. WHO could declare a global emergency when it meets on Monday, Feb 1st 2016. If WHO makes such a declaration, it will essentially be issuing a “a global Amber Alert for public health,” as stated by Susan Kim, a deputy director of Georgetown University’s O’Neill Institute for National and Global Health Law in Washington. This declaration will shine a light on the virus and generate a worldwide response. This is a sensitive matter for WHO because it has only issued global emergencies during three other health endemics: the H1N1 swine flu in 2009, the Ebola outbreak in 2014, and the reappearance of polio in Syria and other countries in 2014. WHO officials want to make sure that nations don’t take inappropriate steps to limit travel or trade because of the virus, said Bruce Aylward, assistant director-general of the WHO. Nonetheless, a strong response erring on the side of precaution is necessary because this virus is an inchoate infection and we have very little knowledge about it. Individuals are being exposed to it and they have no immunity to the infection and therefore more unknown affects and symptoms may arise and cause a serious pandemic. Recently, an influential government appointed panel solicited by Human and Health Services (HHS) gave screening for postpartum depression during and after pregnancy a “B” rating in the Journal of the American Medical Association. This new rating, if accepted, means that the Affordable Care Act would have to cover the screening of mothers during and after pregnancy for depression. As research has developed about this issue it has been found that postpartum depression can occur during pregnancy and if left untreated the mood disorder can negatively impact the child. Some individuals are curious as to why depression may occur in expectant mothers and the answer to that question is still unclear. The postpartum depression may stem from a mother not being able to bond with her child during or after birth or it is sometimes found to be genetic. In more recent years, research demonstrated more mothers suffer from postpartum depression after giving birth to their children. It is said that one of every seven mothers experiences the feeling of depression and only more recently have these mothers felt comfortable to talk to their doctors about these concerns. Several healthcare providers (ex: obstetricians) have said that women have fears of hurting their children or themselves or concerns about the child’s welfare that is out of the mother’s control. This leads to mothers sometimes not being proactive with their prenatal health and if continued to go untreated a mother’s mental illness could affect the child’s well being. Previously, doctors were concerned with the risks of treating depression during pregnancy through a low dose or medication or screening because of the impact the protocols may have on the baby. However, as a result of growth within the medical field there is greater access to mental health facilities, safer ways to screen mothers for depression, and lower dosage anti-depressant medication that mothers can take that do not negatively impact the baby. It is important that women take advantage of these services to allow every mother the opportunity to play an active and positive role in her child’s life. Mayor Bill de Blasio of New York announced a goal to include universal screenings in women’s routine care. While there is a large push to enact legislation for depression screenings during and after pregnancy the panel did not request a certain number of screenings for the expectant mothers during pregnancy and after birth to ensure that all mothers are receiving the proper care. The number of screenings can be determined upon future research and doctors’ opinions on the subject matter to protect their patients. This type of legislation is important because of the increasing number of expectant mothers that seem to be experiencing racing or suicidal thoughts. There is not better way to protect these women than being proactive and making sure the care that expectant mothers need is provided for these women through the new Affordable Care Act. A strong and loving motherly influence is important in a child’s life and the new depression screening guidelines will help make this possible. Congratulations to our new Fall 2015 staffers! 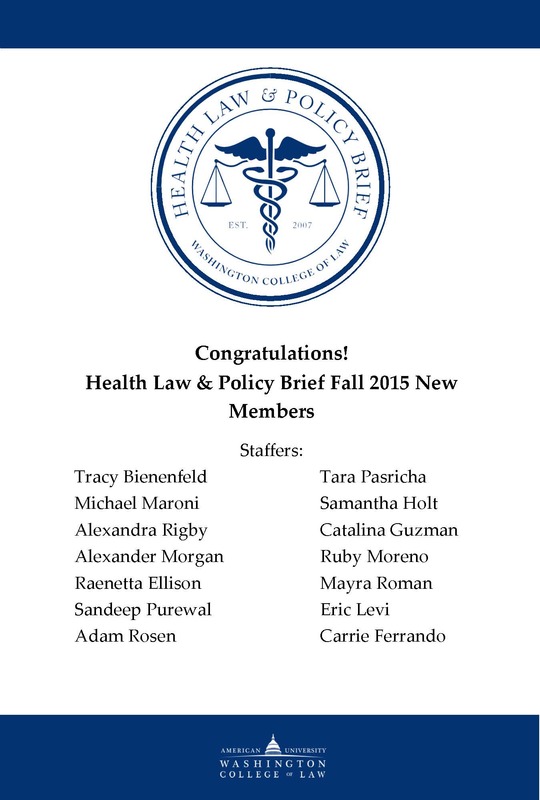 The Health Law & Policy Brief (HLPB) is accepting applications for new members! We encourage 1Ls, 2Ls, 3Ls, and LLMs to apply. The Health Law & Policy Brief covers a broad range of topics including: health care, food & drug, disability law, administrative law, and business law; both domestic and internationally. HLPB is entirely online. We publish long academic articles by students, professors, and practitioners. We plan to have two issues in the coming year – a Fall 2015 issue and a Spring 2016 issue. HLPB also has a blog component, which features short pieces on new and developing topics. The blog​ ​is located at​ ​http://www.healthlawpolicy.org/ ​and​ ​is updated every month. To apply, please email the HLPB Editor-in-Chief, Mohammad Mesbahi, at mohammadh.mesbahi@gmail.com with the​ ​​​subject line “LAST NAME – HLPB Application.”​ ​​Please briefly explain your interest in joining the HLPB, and if applicable, any interest or prior experience in health law, food and drug law, or disability law. Please also attach a current resume (GPA not required). Application deadline: Friday, October 2, 2015 at 11:59am (noon). ​​ We look forward to receiving your application! ​​Applicants who are selected ​to become members of HLPB ​should try to attend the HLPB Spading and Blogging Training on Saturday, October 3, 2015 from 1:00 PM – 4:00 PM in WCL Room 526.​ ​Those who cannot attend would be expected to notify the HLPB Editor-in-Chief and will be allowed to meet at a later time with the HLPB Editor-in-Chief.​ ​ Those attending this meeting should bring a laptop and their Bluebook.